I was tagged by the lovely Leah from Love Leah to have a go at the Would You Rather Tag but with a Christmas twist! I have to be honest and say I dislike both of these but as it has cheese on it I would have to go with the cauliflower! I have a mixture of both on my tree, but I do love lights that twinkle as it makes me feel really festive. It has to be Ferrero Rocher even though they have the cheesiest adverts I can't resist them! Open your Christmas presents with only immediate family or with all your family members? For me it would be immediate family, when the presents are opened first thing in the morning it is usually just the three of us and then we spend the rest of the day with either side of our families. Cook Christmas dinner for the whole family or don't eat Christmas dinner at all? I would cook as for me the dinner is a big part of the day and something I look forward to, and I'm sure Mr S could be roped into help! Have a real Christmas tree or a Fake Christmas Tree? My tree is fake as I don't like the idea of finding pine needles for rest of the next year! Use blue,yellow, white or multi-coloured lights? I prefer multi-coloured lights but I do have a string of just blue ones as well! 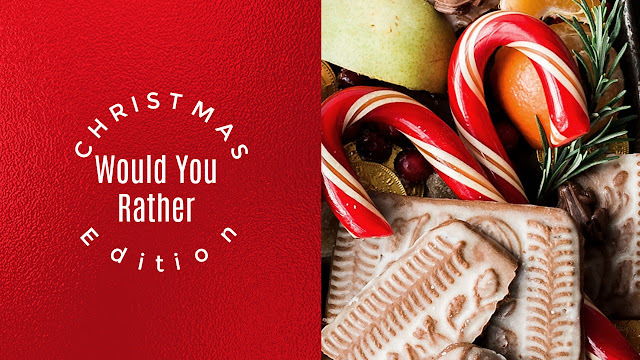 Eat mince pies or Christmas cake? Always Christmas cake as I love the icing and marzipan. As I have a 10 year old the chances of me being still in bed at 10am are slim to non existent so I guess 6am!! Champagne as much as I like chocolate I'm not a huge fan of hot chocolate. That is tough but it has to be Roses as they remind me of my childhood. Get a puppy for Christmas or a kitten for Christmas? As much as I love pets I wouldn't want one as a Christmas present as I don't agree with it, if you want a pet then look to adopt a rescue one and make sure you are fully committed to it's care. It would have to be Home Alone, as much as I love ELF I just howl with laughter at Home Alone. Only be able to listen to Christmas songs all year round or never hear a Christmas song again? All year round as I do love a good Christmas song and it just wouldn't be the same without them. Wake up bright and early and get all of the best boxing day sale goodies or stay warm and cosy in bed wearing your new Christmas pyjamas? Definitely stay in bed if I want to shop the sales I'll do it online from the warmth of my bed!! I was meant to tag four people but as I have left this so late please feel free to take part if you fancy doing so! !